Coastal Corporation sourcing policy ensures all statutory precautions in sourcing the raw material, that is raw head – on shrimps from authorized suppliers and contracted farmers who completely abide by the company policy of non-usage of chemicals, antibiotics and hormones. The material received undergoes various levels of Quality checks as per international food safety guidelines and standards. 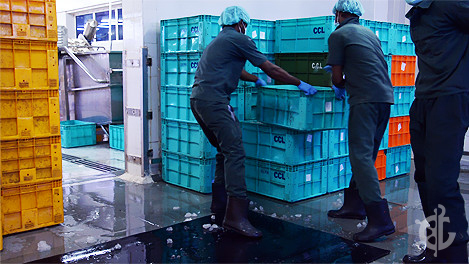 The material is ice packed and stored in a chill room if not immediately taken for pre processing section, to ensure complete freshness and purity. The RAW material that fails the quality control test, is never allowed to enter the production stream & is rejected and returned to the supplier. Company owns fleet of refrigerated and insulated vehicles to aid in the transportation of raw material from the purchase centre’s to the processing plant without deteriorating the quality. The company follows the policy of FIFO ( First In First Out ) to ensure that the products reach the desired process point within the allocated shelf life.